no need for sweaty and expensive gym clothes just step onto the crazy fit in your work clothes and let it vibrate you back into shape while you read or watch TV! Just 3 x 10 minute sessions per day is equivalent to spending 2 hours training with no strain on the joints or the heart as the vibrating plate moves smoothly with speeds from 1-50 levels. 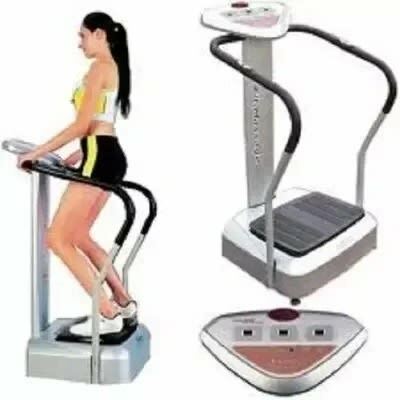 Combining the ancient Chinese medical theories with modern theories, this machine promotes metabolism and eliminates tiredness, unwinding muscles and shaping the curve of the body. The Crazy Fit Machine system is the most scientifically superior method of muscle toning and body reshaping. The system transmits a fast sequence of vibrations specifically designed to activate and stimulate the muscle walls of the body. This allows direct stimulation of the muscles , without producing oxidative stress, which is the typical after effect of intense muscular activity or exercise to the point of producing lactic acid, which is the cause of the disagreeable feeling of ‘hardening’ or stiffening that often follows muscular exercise particularly in unfit people. 10 Minutes equals 2 hours of exercise! Instead of spending 2 hours training, you can now get the same effect in just 10 minutes with the new Crazy Fit Machine exercise and massage system. Step out the office or at home onto the Crazy Fit Machine without the hassle of getting into exercise clothes or rushing through the shower afterwards.